The Royal Cork Yacht Club is inviting EVERYONE to join us on Sunday 5th June to have lots of free family fun and entertainment from taster sailing sessions, RIB runs and boat trips, crab fishing, flipper club activities including face painting and colouring competition, lifejacket clinic and a second-hand watersports gear sale and live music. To coincide with the Cork Harbour Festival, the Royal Cork Yacht Club Family Fun Day Sunday will run from 12 noon to 5pm and will showcase all that the Club has to offer. If you’re a member already, please come along and bring your friends! We really want to welcome everyone to join us at the Royal Cork Yacht Club Family Fun Day Sunday! “Try Sailing” sessions on 1720 sports boats will be operating free of charge on the Fun Day for adults of all ages, to experience the thrills of sailing first hand. The Club 1720s are ideal sports boats for learning, and the club skipper on board will ensure that everyone has a great introduction to sailing. Booking in advance is recommended but not essential for “Try Sailing” sessions during the Family Fun Day. The Royal Cork Yacht Club Bar and Restaurant, The Globe, will also be open and showcasing its new and very popular Brunch Menu and BBQ hospitality, with all food freshly prepared daily. Yacht Club Archivist Dermot Burns will also be on hand during the day, giving talks about the history of the 300-year old yacht club, which proudly holds the title of the oldest yacht club in the world. The Family Fun Day ties in with the Cork Harbour Festival line up which kicks off with the Ocean to City Race on 4th June. 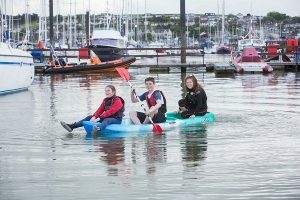 For a unique day out and wonderful experience for all, the Royal Cork Yacht Club Family Fun Day will run from 12 Noon to 5pm on Sunday 5th June in Crosshaven where festivities will be ongoing all day long. Mixed Dinghies Are on a Roll….